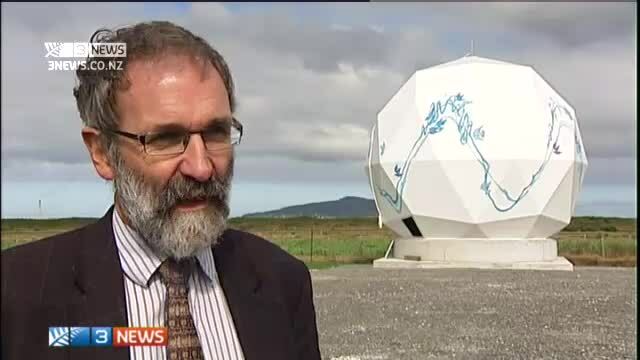 In April 2014, Planet Labs announced they were setting up a ground station at the Awarua Tracking Station in Southland, to downlink imagery from their constellation of Earth Observation satellites. A small space base near Invercargill is part of an ambitious new project aimed at photographing the entire planet every day. A fleet of satellites will transmit the pictures back to ground stations on Earth, including one on remote farmland at Awarua, in Southland. The five-metre dish antenna is New Zealand's connection to the newest eyes in the skies. Housed in a giant golf ball called a "radome", it's one of two ground stations linked to the world's largest network of Earth-imaging satellites. "Throughout the day there will be several passes of satellites that will pass overhead," says Planet Labs radio engineer Matt Ligon. "The dish will point at them, it will have back-and-forth communication with the satellite and download imagery data from the satellite." Awarua was chosen for its remote location and lack of radio interference. The base has previously been used by the European Space Agency to monitor resupply missions to the International Space Station. "A lot of the spacecraft go over the poles, and the further south you are the better," says venture Southland enterprise project manager Robin McNeill. "So clearly Southland's got an advantage over anywhere else in New Zealand." San Francisco company Planet Labs has already launched 28 of its small satellites, or "doves" into space. The shoebox-sized devices are fitted with fold-out solar panels that power the cameras and systems. Each satellite continuously photographs the Earth's surface as it moves in orbit, at a resolution down to around four metres. That's enough to show details as small as a car. It is not as precise as Google Earth, but images there can be up to three years old. Planet Labs aims to offer a daily photo mosaic of nearly every corner of the globe. That could have applications for agriculture, fishing and environmental monitoring, as well as potentially helping track missing planes like Malaysia Airlines flight MH370. "Pretty much any application where you want to see how the world is changing daily, that's what we can do," says Mr Ligon. The company plans to launch more than 100 more satellites this year, allowing near real-time monitoring of the world we live in.